The People Factor – Understanding the future nature of work in customer service. It’s generally agreed that the role of people in a contact centre will increasingly become one of problem-solving; dealing with more complex enquiries and transactions. But while the overall pattern is accepted, the implications of it for organisations and customer service advisors have not been widely explored. 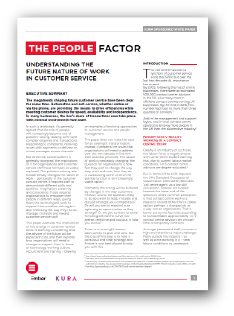 With this in mind, Kura commissioned Ember Services to produce “The People Factor “, a new report to understand the future nature of work in customer service. The paper does not make the case for an overnight transformation; instead, it presents the issues that organisations will need to address over the next decade in line with their business priorities. Complete this form, to download your copy of this report.